It looks like pulp scifi is indeed back in a big way. 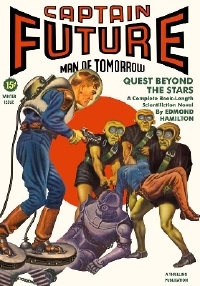 We just found out that director Christian Alvart (Pandorum, Case 39) has been awarded script subsidy by Germany's FFA to adapt Edmond Hamilton's pulp scifi novel "Captain Future" into a massive screen adventure. "I was a huge CAPTAIN FUTURE fan growing up. In elementary school I spent my whole allowance on the toys and the sticker collection which were quite a big deal in Germany. There was the popular Anime show in the 80's of course, but I also read all the original novels by Science Fiction pioneer Edmond Hamilton and loved them. It took us a couple of years to investigate and option the rights for the CAPTAIN FUTURE property and I'm very happy that we have the development financing together and are finally ready to move forward with the script. We are developing CAPTAIN FUTURE as a big fun space opera for the whole family - hoping to recreate that same sense of excitement that I had discovering space through the CAPTAIN's eyes. There are many smart and adult ideas in the franchise for grown-ups to enjoy, but this will definitely be something they can take their kids to as well. Like THE FIFTH ELEMENT this will be a big budget Science Fiction movie developed and produced out of Europe with an international cast. CAPTAIN FUTURE still has a huge fan base in countries like France (CAPTAIN FLAM), Italy (CAPITAN FUTURO) Germany and the UK. I know the fans will watch very closely where we take their beloved CAPTAIN and I hope they will be as excited about him conquering the big screen as we are now working in his Universe. CAPTAIN FUTURE will be about Curtis Newton's first adventure and therefore - in part - his origin story. We are also in development on a possible sequel called CAPTAIN FUTURE - WIZARD OF SCIENCE which would be ready instantly if box office returns are promising. And yes, since I get your question all the time: "Will we see the COMET in 3D?" You bet we we will!" So there you have it folks. If that's not the scifi scoop of the day, I don't know what is. As the months go by we hope to bring you even more goodies from the tantalizing project. Alvart and a project like this would something special, wow! I loved Captain Future as a teen and found him around the same time I found Doc Savage. I had always thought that Captain Future would make a great movie and had dreamed of directing it myself (I am a Commercial Producer). I visualized it exactly like the novels, done in a retro way with updated technology. The novels are fun and the science can be adjusted to modern times. So much to draw from... I can't wait. Good luck. WHAT A REAL MOVIE! YEEEAAAAAA I hear the German main theme right now and was just surfing along for CF with googel and found THIS! DAMM THIS WOULD BE SO GREAT. PLEASE let it look like the anime PLEASe. The Books are great but the look and feel MUST be the anime one. You stole my idear ! no real brutaltity but even in the original movie died the one or the other. when im about 60 just becouse im so disappointed whith your version. i found captain future working as a waiter at "da ugo" in m&Atilde;&frac14;nchen-pasing !